This is the most notable group of puffers known for their ability to "puff up" when alarmed or challenged. This is actually done by rapidly ingesting large quantities of water into a distensible part of their stomachs (the ventral diverticulum). Both the true puffers and Sharpnose Tobies also have characteristic teeth plates that look more like beaks. Other characteristics include the more posterior position of their unpaired fins (like other tetraodontiform fishes; triggers, Boxfishes... used for slow, exacting locomotion) which are w/o hard rays, a lack of ribs and scales (hard to blow up with them), and slit-like gill openings. Again, on the negative side for aquarists is these fishes possession of tetrodotoxin, powerful poison to ward off would-be predators. A problem at times for ones that die, dissolve w/o notice in aquariums, and at times simply release same into their waters. Do not disturb. The Tetraodontinae appear broadly rounded in cross section. Of the eighteen genera, only Arothron is regularly sold in the west. This genus has nothing but exemplary, personality species. Most often available are the guinea fowl (A. meleagris), bulldog or black-spotted puffers (A. nigropunctatus), in black, gray, golden forms, or a splotchy mix thereof. The Indo-Pacific stars and stripes puffer, A. hispidus is found now and then and is also excellent. Here we'll highlight the most commonly available species of "true" Puffers used in the aquarium interest. Amblyrhynchotes honkenii (Bloch 1785), the Evileye Blassop. Indo-west Pacific, from South Africa to China. To twelve inches in length. Amblyrhynchotes rufopunctatus Li 1962. Western central Pacific and South China Sea. 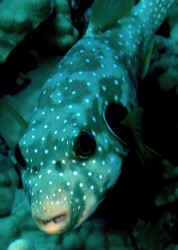 Arothron carduus (Cantor 1849). Eastern Indian Ocean. 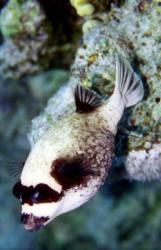 Arothron diadematus (Ruppell 1829), the Masked Puffer. Western Indian Ocean and the Red Sea. An expensive look-alike to the Indo-Pacific Arothron nigropunctatus. Both to about a foot in length and hardy in captivity. This one in the Red Sea. 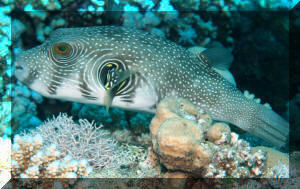 Arothron hispidus (Linnaeus 1758), the White-Spotted Puffer. Indo-Pacific, Red Sea, east African coast, tropical east Pacific coast. To twenty inches in length in the wild. Cute when small, and very hardy... just big eaters and mess makers. At right, one in the Galapagos, below are pictured a four inch juvenile in captivity, one in Hawai'i, a one foot specimen in the Red Sea, and a fifteen inch mottled or "koi" one in the Seychelles.